In Part 3 of its three-part series on preventable traffic crashes, https://www.injury-lawyer-florida.com looks at the dangers of sleepy and distracted driving. Florida injury lawyers handle hundreds of car accidents, motorcycle accidents and trucking accidents each year. In many instances, distracted driving is a cause of the traffic crash. Evidence that distracted driving in all its forms is a leading cause of as many as 4 out of every 5 crashes has Florida considering banning cell phones behind the wheel. A landmark study by the National Highway Traffic and Safety Administration and the Virginia Tech Transportation Institute found 80 percent of crashes and 65 percent of near crashes involved some form of driver inattention in the three seconds leading to the crash. Primary causes of driver inattention are distracting activities, such as cell phone use and drowsiness. Florida lawmakers are considering several legal changes banning cell phone use and/or text messaging by drivers. One version, known as Heather’s Law, is named for a young north Florida woman who was killed on her way to the wedding planner in a crash with a semi driver who was allegedly text messaging. While 1 in 7 drivers admitted to text messaging while driving, nearly half of teen drivers admitted sending text messages or e-mail while behind the wheel of a car. If adopted, Florida would join five other states that ban cell phone use by drivers, including Washington, California, New York, New Jersey, Connecticut, and Washington, D.C.
* Drowsiness is a significant problem that quadrupules a driver’s risk of a crash or near-crash. 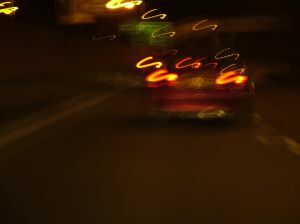 Drowsy driving may be significantly under-reported in police crash investigations. * The most common distraction for drivers is the use of cell phones. However, the number of crashes and near-crashes attributable to dialing is nearly identical to the number associated with talking or listening. Dialing is more dangerous but occurs less often than talking or listening. * Reaching for a moving object increases the risk of a crash or near-crash by 9 times; looking at an external object by 3.7 times; reading by 3 times; applying makeup by 3 times; dialing a hand held device by 3 times and talking or listening on a hand-held device by 1.3 times. * Drivers are often unable to predict when it is safe to look away from the road to multi-task because the situation can change abruptly, leaving the driver no time to react. According to www.drowsydriving.org, at least 100,000 police-reported crashes a year are the direct result of driver fatigue. Each year, drowsy-driving crashes result in at least 1,550 deaths, 71,000 injuries and $12.5 billion in losses. * Impaired judgment and vision. * Decline in attention to important signs, road changes and the actions of other vehicles. * Decreased alertness, preventing you from seeing an obstacle and avoiding a crash. * Increased moodiness and aggressive behavior. * Problems with processing information and short-term memory. * Microsleeps — brief 2/3 second sleep episodes. * Watch for the warning signs of fatigue. * Stop driving — pull off at the next exit or rest area, or find a place to sleep for the night. * Take a nap — find a safe place to take a 15-20 minute nap (more than 20 minutes can make you groggy for 15 minutes or more after waking). * Consume caffeine — the equivalent of two cups of coffee can increase alertness for several hours, and usually takes about 30 minutes to enter the bloodstream. * Try consuming caffeine before taking a short nap to get the benefits of both. * Let a passenger take over the driving. Safety is not an accident — you can take specific actions to be a safe driver and passenger. Each year, thousands of people are seriously injured or killed by the negligence of distracted drivers. If you or someone you love has been in an accident, there are certain things you can do to help protect your rights. Our Florida injury lawyers offer free appointments to discuss your rights at offices conveniently located throughout Southwest Florida, including Fort Myers, Cape Coral, Port Charlotte, Naples, Arcadia, Sebring and Venice.